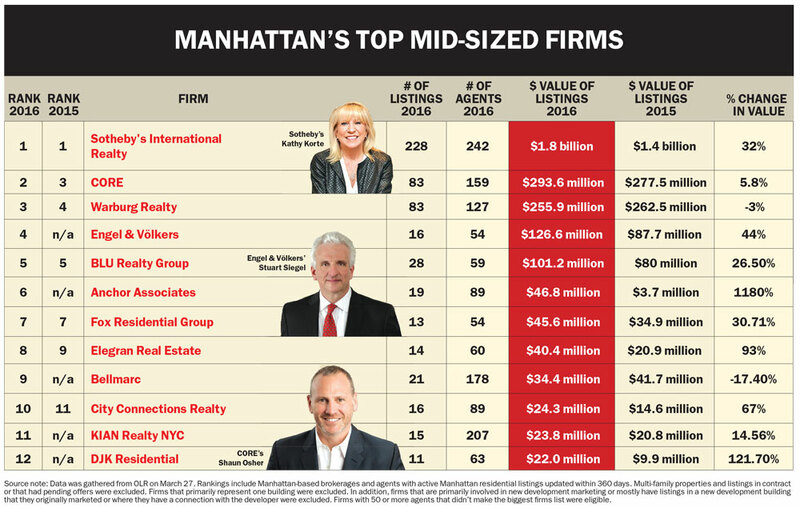 Elegran is honored to be featured as # 8 in “Manhattan’s Top Mid-Sized Firms” by The Real Deal today, climbing the ranks of NYC’s top 10 real estate companies in 2016, posting the largest increase in listing value by percentage of any non-newcomer to the list. Released today, the report shows Elegran ranking eighth in the city, with $40.4 million in listings, doubling 2015’s numbers and jumping up in the rankings—stats which do not include the $25 million listing at The Plaza that just went to market yesterday. With nearly $73 million in combined listing value currently available as of May 4th, according to OLR, Elegran is quickly becoming one of the leading firms in the Manhattan real estate market. Positioned to service the luxury sector of the NYC market, in the eight years since the company was founded, Elegran has been known for its expertise in buyer’s agency for new construction, contracting over $ 400 million dollars in deals in 2015 alone (Elegran’s tight-knit team of 60 agents represents roughly 1.5% of the New York real estate market overall), and Elegran is proud to be recognized as one of the top real estate firms on the sell-side of residential real estate as well.